Have you ever had that moment in your life when, you're in a terrible mood and something completely random makes your day? It could be something not many others, may notice. A butterfly, a hug, a piece of cake..it could be anything! I had one of those moments today and I feel like I've had some sort of epiphany. Do you want to know what caused it? 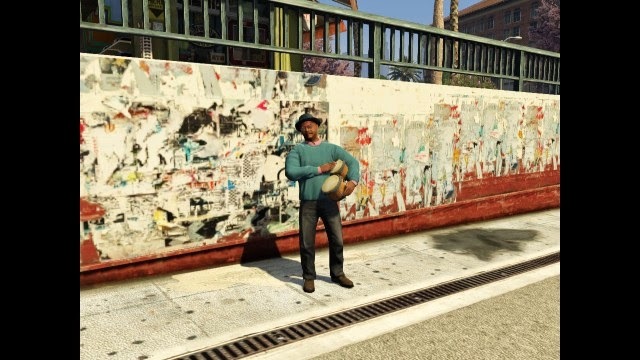 An old man playing the bongos in Grand Theft Auto. I noticed that little random things during the day, made me really happy and for the first time in a long while, I started to appreciate the life I have and stopped wishing for "something better". Little things like, robbing GTA stores with a friend or having someone listen to my problem, instead of me listening to theirs. And we finally get to the epiphany I had; less really is more. In fairness, I should have had this epiphany a long time ago. I went through a rich phase and I didn't know what to do with myself. I always told myself that money was important but, come to think of it, it was never something I really wanted. Ever. I wouldn't consider myself to be a selfish person. Feel free to disagree but, I think it's one of my best qualities. I treat my friends to gifts, when I can, and I've done my fair share of charity and voluntary work, in the past. Always because, I thought of myself as a bad person and I had to redeem myself, for something I never did. Second possible epiphany; Am I really a genuinely nice person? Am I a bad person redeeming myself? Do I just feel bad because, no-one ever says "thank you, I appreciate it?" What was the point of this again? I don't know if I've made a point or, if I've even made any sense. I just really felt like writing something and, this was playing on my mind. Maybe I just wanted to praise Bongo Guy? I don't even know. I suppose, I just enjoy being nice and instead of being horrible to people who give me a hard time, maybe I should just be nice to them because it makes me feel good? I don't like stooping to their level. I think I've had another epiphany. Have a lovely day/evening/night and be good to each other!